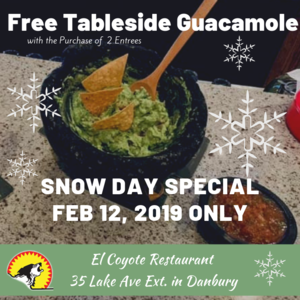 Visit El Coyote at their new Danbury location on February 12 to receive a free tableside guacamole* with the purchase of two entrees. El Coyote uses the freshest ingredients on our elaborate traditional Mexican dishes in a family friendly atmosphere to offer you excellent service and the authentic Mexican taste. El Coyote will add just the right amount of spice to suit your taste, from a small whimper to a fiery pepper bite and anything in between. Our exquisite guacamole is prepared right at your table, served with warmed corn tortillas. You’ll immediately notice something special once you come to El Coyote. We offer an extensive menu full of Mexican favorites which includes beef, chicken and seafood entrees. Churrasco: Sizzling grilled skirt steak marinated with fresh herbs and spices accompanied by Chimichurri sauce. Chiles Rellenos: Roasted poblano peppers dipped in egg butter, pan fried, staffed with your choice of beef, chicken or shrimp. El Coyote is located at 35 Lake Avenue Extension in Danbury CT and will open at 11:30am. Call ahead (203)546-7355. Visit their website at www.elcoyotemexico.com and Facebook Page.